So on Saturday 9 February I was planning to have quadrilogie de canard for lunch at LeVaffiue, Les Get in the French Alps. But life intervened and instead, I found myself lying in agony in the snow with a broken femur beside Le Yeti ski lift waiting for a helicopter medevac. That evening I was planning to have a lovely cosy dinner with Nick and our friends in Geneva. But life intervened and instead I found myself under general anaesthetic on an operating table in a hospital in Thono- les-Bains, having a titanium rod inserted into my right femur. The following morning I was planning to fly back to London and go to work. But life intervened and instead I found myself in a hospital ward with 21 staples and a nerve block catheter in my grotesquely swollen right leg, wondering how I would ever walk again. That week I was planning to go to work, to cook dinners for Nick, to play with my cats, and maybe to catch up with friends. But life intervened and instead I found myself stuck in a foreign hospital, battling anaemia and fighting with two insurance companies over when I could go home and where I would go once I got to the UK, seeing as my house had no facilities for the mobility impaired. Last Thursday I was planning to fly to Cape Town for my annual dose of South African sunshine. But life intervened and instead I found myself in The Blackheath Hospital, learning how to walk up stair on crutches. Utterly terrifying. Last Saturday I was planning to be one of the main speakers at the South African Food & Wine Blogger Indaba conference. But life intervened and instead I found myself housebound and on crutches, learning to give myself daily anti-coagulant injections and following proceedings at the Indaba via Twitter. Yup, life sure happens with a vengeance while you are busy making other plans. Somewhat less dramatically, back in the summer, Nick planned to grow some South African gem squash on is allotment. Sure – four of the plants produced masses of beautiful dark green, perfectly round gem squash. 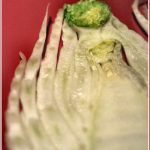 But the other plant became known as The Mutant. We’re not sure of a foreign seed managed to slip into the packet; or whether there was some sort of illicit affair going on between a gem squash and a neighbouring zucchini. But the end result was that what Nick harvested was nothing like the gem squash he was planning. It was roughly the shape of a very small watermelon – elongated yet chunky – and with a green skin like a zucchini but not as soft. Inside, it was pretty much as expected – more pippy than a zucchini and stringier than a gem squash. I have no idea what a botanist would have called this mutant squash, but I decided it was a spaghetti squash. Besides – who wants to bookmark a recipe called “Mutant Squash Risotto”? 😉 Having learnt my lesson last time I cooked spaghetti squash, I already knew better than to try and slice it up and stir fry it like a zucchini – the skin is simply too tough. So I decided to roast it and scoop out the pulp to make risotto – the spaghetti strand-like texture of the cooked squash means no pureeing or mashing is necessary – just smoosh it with a fork. The flavour of the squash flesh is quite bland so I pepped up the recipe with salty feta and chill but do feel free to play with the flavours – tons of lemon instead of chilli; maybe blue cheese instead of feta; or harissa paste substituted for the chilli. The possibilities are endless. Either way, the end result is like a warm hug in a bowl. So whatever you were planning for dinner, allow life to intervene and try this simple crowd-pleaser. This soothing risotto is pepped up with the zing of chilli and some deliciously salty feta - a stylish and simple vegetarian dish. Pre-heat the oven to 190C. Place the squash wedges skin side down on a baking sheet, dot each with butter and sprinkle liberally with dried thyme. Roast for 45 minutes or until the squash is soft. Scoop the squash flesh off the skin and set aside for later. In the meantime, melt 20g of the butter together with the olive oil in a large, heavy-bottomed saucepan. Add the onion, garlic and chilli flakes and sauté until the onion is translucent and soft but do not let it brown. Add the rice and cook for a minute or two, stirring constantly stir so that each grain is well-coated with oil/butter. Add the wine and keep stirring until the liquid has been absorbed almost completely. I haven’t tried spaghetti squash yet but this sounds delicious. All your plans sound a whole lot more fun than the non-plans that replaced them, but maybe life has got something up its sleeve to make up for it… gotta be a silver lining somewhere or a pot of gold at the end of the rainbow or diamonds in the sky or something! What a tough you you must have had over the recent weeks since your accident and there is no way to foresee this coming. I had really enjoyed seeing all of your Instagram ski photos but then this happens….awful. 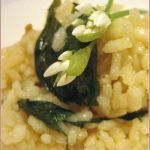 I am so impressed that you are able to write, photograph and enjoy dishes such as this delicious risotto. I think I need to get trying more squash down at my allotment too! You have been through such an ordeal and have just cemented the idea that I never want to go skiing. However I am more than happy to try that risotto. It looks really delicious. Kudos for making it while you are still struggling. 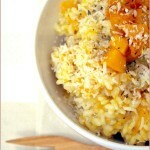 Love the idea of this risotto squash, feta and chilli exciting flavors. Scrumptious and comforting! This risotto is wonderful. Just made this delicious recipe after correctly identifying spaghetti squash in a box full of mixed squash! The balance of spice from the chilli and the the salt Of the feta is just right and the texture of the squash is wonderful. Thanks a lot. Makes a great change to the traditional chicken or mushroom risottos I’m prone to making. And here’s to a better week! 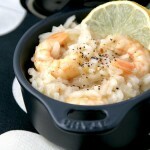 I am using a similar recipe but cooking it way less time, just because I am using a multicooker ( Redmond brand ). It can work under the pressure so I am saving my time. Also, anyone can advice me what to put instead of chilli flakes and garlic to have a good taste but no harm for my stomach?